Two years after the sinking of the Titanic, Rebecca Crowe’s fascination with icebergs leads her to save a shipwrecked survivor, Samuel Dalton. Love sparks in the crystal cave of an iceberg but is thwarted by an unreasonable father and the Great War that drags Samuel and his brother, Matthew, to the Western Front as medical officers. Knowing Rebecca is home safe in Newfoundland brings Samuel great comfort. But as the war moves towards its final harrowing days they both discover that tragedy and terror can strike anywhere. Only when Samuel and Rebecca can fully come to terms with such devastating loss and their impossible choices can their love soar. Seldom Come By is written by Sherryl Caulfield, an Australian author. 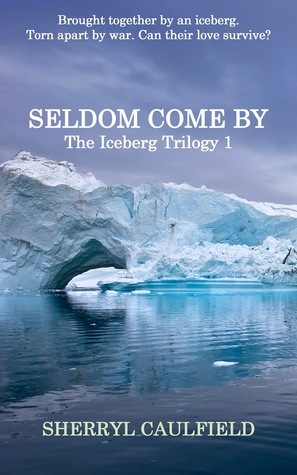 It is the first book in her Iceberg trilogy. I first heard of this book when I was reading a post by The Electic Reader reviewing the second one in the trilogy, Come What May. Sheree was very convincing and I was hooked! Seldom Come by was on special over at Amazon and I went straight across and bought it. I was even more blessed when I won a copy for the second one - Come What May at The Eclectic Reader blog. So of course with that excitement I needed to set myself down to read the first. All I can say is - oh wow! Fabulous read. Loved it. This book as it begins is set in Newfoundland, on an island where at times icebergs pass by. It is a bleak place but fishermen eek out a living there. Later on the book is set in Toronto and in Europe during the war of 1914 - 1918. Living on Second Chance Island is Rebecca - the heroine of this story, and her sister Rachel and her parents Silas and Esther. Rebecca is a strong young woman, she is like the son her parents never had. One day Samuel - the hero arrives at the island. At the time Rebecca is just about to be 15 years and Sam is about 19. The characters are very real, I was hooked into their lives and all of them mattered to me. Silas was the one I found it hard to find compassion for - he is quite superstitious and uses religion and scripture in a way I am sure it was never intended. The settings are very real, obviously Sherryl Caulfield has done her research and every part of the book was evocative of that time and place. If I didn't ever want to go to Newfoundland before, I do now. When I had finished this book I felt emotionally wrung out. There are highs and lows that just demand of the reader that you experience some of what the characters are living through. At times it was hard to read, at times I wondered whether characters would reach some kind of closure with integrity. I am not mentioning any details about the plot, it is best that you read it with no spoilers. Just be prepared for an epic journey within and outside the characters' lives. Well written, beautiful, haunting. I need just awhile to let this book settle before I reach for the next, Come What May, but I do know I am in for another treat. If there is one book to take a risk on this year - make it this one. I did, and I have been richly rewarded. I enjoyed your review Katheryn. This sounds like one I would enjoy. I'm glad you enjoyed it so much. Congrats on winning the second book. Thanks Pat. Yes very excited to win a copy of the second book. Wow Kathryn this sounds wonderful. I made need truffles while reading it though. I love the time period and setting. I will add it to my wishlist. Kimba, it was a book I thoroughly enjoyed, hope you give it ago - er with or without truffles!! Excited to find your review as I won a copy ! I am saving it for one of my Around the World in 12 Books reading challenge. Maybe it will also fit the WOmen's Fiction category? I hope you love it. Definitely fit into Women's Fiction category no doubt about it. Great win. I bought this one, but won Seldom Come By which I was very happy about and its going to be my first read of 2015.